For several years now, Magic Christian has researched the life and works of, Johann Nepomuk Hofzinser, the father of all card conjurers, who was also a contemporary of the singer, actor, and playwright Johann Nestroy. In his Salon in Vienna’s Wollzeile, (and later in the Himmelpfortgasse and the Walfischgasse), respected people from Vienna’s high society would meet to enjoy his “Hours of Deception”. HOFZINSER was noted for skilfully blending political satire and comments on current events into his performances. HOFZINSER began work as a commercial trainee in the family business, later he worked as a clark in the Financial Department. He was sponsored by Count Stadion von Warthausen, as was the well-known Austrian dramatist, Franz Grillparzer. Through his presentations of magic, which were by invitation only, HOFZINSER was accepted into the upper classes of Vienna’s society. The local and international press applauded his inventive and entertaining presentations that made magic “socially acceptable“. His creative ideas influence magicians to this very day and he is rightfully referred to as the father of parlour- and card-magic. The card experiment “To think and forget”, “Vision of an Insane”, his watch-tricks, the “Rose-Mirror”, the “Appearing Lady” and his unforgettable card-magic were all parts of an extensive repertoire. “The Professor” Dai VERNON often mentioned HOFZINSER in his books. He said that his motto “be natural” leads back to HOFZINSER’s performances. Most of what we know about Johann Nepomuk HOFZINSER is based on the work of Ottokar FISCHER (1873-1940), who published his findings in his books “Kartenkünste” (1910) and “Zauberkünste” (1942, published by Fredo MARVELLI). From then on, nobody cared about the existing material, until (by mere chance), another part of HOFZINSER’s enigma was uncovered. 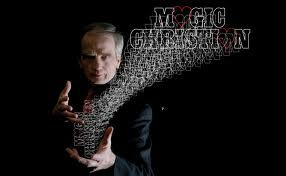 During long years of intensive and laborious research, MAGIC CHRISTIAN has discovered new sources about the life and magic of HOZINSER and has changed our understanding about this genious of Austrian magic. It transpired that the material was sufficient to fill three books with humour, historical facts, and effects. Completely new effects stand side by side with the “Piecen” (experiments) discovered by FISCHER. For the first time, this master of parlour-magic is presented as a real person. Fascinating descriptions of his surroundings and his character add to the addictive content of the books. HOFZINSER is presented as legendary magician, a romantic poet, a hated critic, a keen balloonist, and a friend of various well-known celebrities of the time. MAGIC CHRISTIAN has discovered much new material and revised existing sources to present the life of HOFZINSER for the first time as it really was. Because of the importance of this work, the author and the publishers have decided to limit the edition to 999 (numbered) books. 1st Volume: This volume was first published in 1998 and contains the newly found bibliographic material; Hofzinser’s diary, preserved letters, many original descriptions of his conjuring art and a list of his performances in the Austro-Hungarian monarchy and in Germany. 352 pages, 178 figures, size 28.5 cm × 20 cm, stitched binding, cloth covered with dustcover. The price is € 92.00. 2nd Volume: This volume was published in 2004 and is dedicated to the card-magic of Hofzinser. The performing arts, card gimmicks as well as known, and until now unknown facts, plus some historical updates of the first volume and a detailed bibliography. 408 pages, 245 figures, size 28.5 cm ×20 cm, stitched binding, cloth covered with dustcover. The price is € 92.00. 3rd Volume: This volume was published in December 2012 and because of its scope, it was split into two physical books (3A + 3B). They focus on Hofzinser’s saloon magic, his psychology, his music, his gimmicks and effects, performances with balls, cups, coins, paper money, mental magic, arithmetic experiments, performances with flowers, liquids, bottles, rings, strings and many other items. Also descriptions from Heubeck’s notebook that have not been published until now, and the best of Hofzinser’s ingenious quotes. 672 pages, 507 figures, size 28.5 cm ×20 cm, stitched binding, cloth covered with dustcover. The price for the two books (3A + 3B) is € 128.00. All books can be ordered from Edition HUBER or from MAGIC CHRISTIAN.